For longer than we even realise, marijuana has been inhaled, infused and just enjoyed. In these modern times of meat free Mondays and taco Tuesdays, what better way to infuse your celebratory days with a little bit of Mary Jane too. The last decade has seen an increase in edible marijuana goods, and a drop in smoking joints. This could be due to a number of different factors however more and more people are seeking an alternative to smoking marijuana. The benefits of enjoying marijuana by way of infusing in your food has many various benefits. A main reason that many people tend to bake brownies, pot muffins, or weed cookies is that it is a much more discrete way of getting high, Even though cannabis has been legalised in many ways, it is still illegal under federal law and smoking marijuana in public is still illegal in most states, cities and counties. People began baking with marijuana as a way to get high in public without having to make obvious clouds of haze cannabis smoke hang in the air. In addition to edible cannabis being more discrete, it also tends to pack a pretty hefty punch. Watch your dosing and be sure to try a little before a lot otherwise you could become more cannabis comatose than you originally intended. Animal clinical trials and other studies have been done to test the theories that people have had for decades about cannabis being a healer. There are thousands of testimonies from people about marijuana being an effective tool to treat chronic pain, insomnia, seizures, and a wide range of nervous system disorders. Whatever your reason for enjoying cannabis edibles, the most important part of any Mary Jane infused foods is the infusion itself. There are two main ways to do this, oil and butter. Some individuals find that cannabis butter has a potent taste and smell, which can ruin the enjoyment of certain foods. However, if you are one of these individuals then you may find that your tacos are the answer. Taco have a strong taste which can actually override that of the marijuana smell and taste. 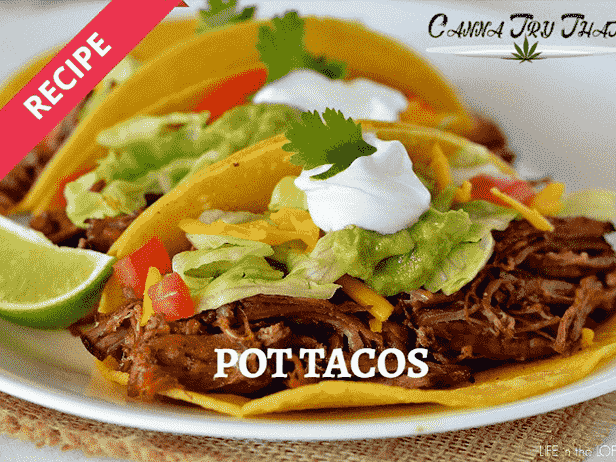 This recipe uses cannabis butter and you will see how the taco and cannabis blend together seamlessly. A taco is traditionally a food from Mexico, and enjoyed throughout the United States. It is a tortilla that can be filled with all sorts of delights and the meat and spice can hide the unsavoury cannabis butter taste. Ensure that the taco shell is soft and pliable. Put it out on a plate. Spread an even layer of your marijuana infused butter over the soft taco shell. Make sure it covers the entire surface area of the taco. If you are using meat for your taco, place you already cooked meat down as the next layer. Make sure it is nice and even. Next comes the cheese- add a generous layer of cheese and allow this to now melt in the oven on 350°. Be careful not the leave the taco in for too long, you just want the cheese to begin melting thoroughly. If you wish to avoid meat you can use the beans in place of the meat. You can also precook the beans, using some spices flavours as well. Additionally, there are various vegetarian options you can find in stores as a meat replacement. Now comes the fun part! After you have taken your taco with the mouth watering melted cheese out the oven, place it on a counter surface. Place all the assortment of bowls with the various ingredients and extras and get creative. The sour cream and avocado blend exquisitely with the melted cheese but you will need a flavour to lighten it up as well. Add some tomatoes to add a lift to the palette and some lettuce to freshen it as well. Cilantro on the top of the taco is heavenly and almost sinful to leave out. You will find the butter, cheese, and sour cream rather rich so come hungry and experiment with the flavours. You may even find that the marijuana tase in the butter blends in deliciously with the Mexican flavours. The beauty of the taco is that it has strong and potent flavours that overtakes your tastebuds. For those that struggle to enjoy the test of marijuana infused foods the taco is a wonderful way to enjoy cannabis edibles.